The Highway 401 underpass at County Road 31 is located near Morrisburg, in the Municipality of South Dundas. Temporary closures of the Highway 401 / County Road 31 ramps at various stages of construction. ​During overnight closures of Highway 401 and County Road 31, as well as during temporary closures of the Highway 401 ramps, traffic is proposed to be detoured via County Road 31, County Road 2, County Road 41 (Upper Canada Road) and County Road 1 (Carman Road), as required. This study is being carried out in accordance with the approved environmental planning process for Group ‘B’ projects under the MTO Class Environmental Assessment (Class EA) for Provincial Transportation Facilities (2000), with the opportunity for public input throughout the study. Upon completion of the study, a Transportation Environmental Study Report (TESR) will be prepared, and filed for a 30-day public review period. At that time, newspaper notices will be published, letters will be sent to the project mailing list, and the website will be updated to explain the review process and identify locations where the TESR can be reviewed. The Project Team welcomes public comments at any time during this project. All information will be collected in accordance with the Freedom of Information and Protection of Privacy Act (FOIPPA). With the exception of personal information, all comments will become part of the public record. ​Should you require further information regarding this project, or wish to submit comments or questions please visit the Contact tab. If you have any accessibility requirements in order to participate in this project please contact one of the Project Team Members listed on the Contact tab. Members of the public were notified of Study Commencement and the online Public Information Centre (PIC) through a ‘Notice of Study Commencement / Public Information Centre’ published in the Morrisburg Leader on April 19, 2017 and the St. Lawrence News on April 20, 2017. An online Public Information Centre (PIC) was held to provide members of the public, external agencies and other interested stakeholders with the opportunity to review the proposed design, anticipated environmental effects and the mitigation proposed to address potential adverse effects. PIC materials were posted directly on the project website, and were also available to download for off-line viewing. Stakeholders and members of the public were encouraged to review the materials and submit comments directly to the Project Team via the project website. Display materials for the online Public Information Centre were made available on April 27, 2017 and can be found here. 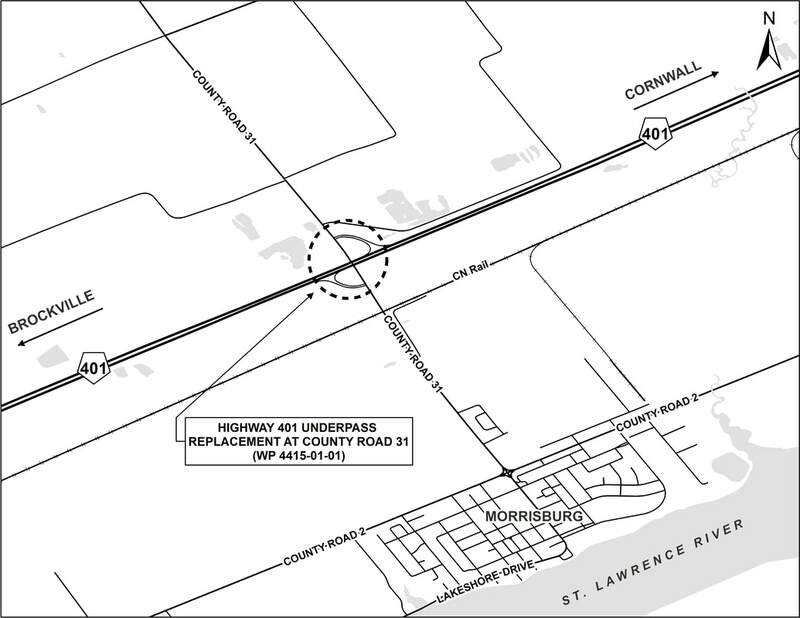 The Ministry of Transportation has completed the Detail Design and Environmental Assessment Study for the Highway 401 underpass replacement at County Road 31. A Transportation Environmental Study Report (TESR) has been prepared and is filed with the Ministry of the Environment, Conservation and Parks for a 30-day public review period from October 10 to November 9, 2018. A Notice of TESR Submission was published in the Morrisburg Leader and Brockville Recorder and Times on October 10, 2018. Interested persons are encouraged to review the TESR document and provide comments by November 9, 2018. You can review the TESR document here. Should you require further information regarding this study, please feel free to submit comments directly by filling out the comment form on this page. Please note that information will be collected in accordance with the Freedom of Information and Protection of Privacy Act (FOIPPA). With the exception of personal information,all comments will become part of the public record. ​If you have any accessibility requirements in order to participate in this project, please contact one of the Project Team members listed above.